Our best prices instantly, buy 100% online, home delivery. 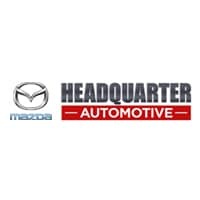 At Headquarter Mazda we know you think a lot about where to take your car when it needs a checkup or repair. Bring it by the Headquarter Mazda Service Department to be sure you are giving your car the best care possible. Our expertly trained service staff are experienced in knowing how to properly service any vehicle. The Headquarter Mazda service department will always take the necessary measures to make sure your car makes it back on the road safely. Shawn Pacheco was very helpful in helping me choose my future car, 10/10 would go back here again and use Shawn. He was very polite and helpful. Excellent service and employees y love this Mazda Headquarter is so clean and neat and the price is right. Also while you waiting for your car been work on they have very good snacks, cookies and coffee, What else can you need. Welcome to Headquarter Mazda. We are located close to the family entertainment capital of the world, Orlando, here in Clermont, Florida, convenient to Winter Garden. We have all the latest new Mazda models, including the popular Mazda MX-5 Miata roadster and the full size Mazda CX-9 SUV. We also carry an impressive selection of pre-owned vehicles, as well as Mazda Certified Pre-Owned cars and SUVs. Mazda CPO vehicles have endured a rigorous round of requirements to earn their certification, including passing a 150-point quality assurance inspection. Every member of our staff works together to provide you the best auto buying experience possible. Once you have chosen your vehicle, the experts in our finance department will work with their network of lenders to find you the best loan rates possible, regardless of your credit history. You can prepare for your visit by filling out our handy credit application, and even appraise your trade-in right on our website. Our commitment to you is not over once you drive your Mazda off the lot. We stand behind our vehicles, and the factory trained technicians in our service department know Mazda vehicles inside and out. Whether you need a simple oil change or major repair work, we are open 6 days a week to get you back on the road as soon as possible. If you decide to repair your vehicle yourself, be sure to use genuine Mazda parts, most of which are available from our parts department. We also carry a wide variety of accessories to make your vehicle as unique as you are. We looking forward to meeting you soon at 17500 State Route 50 in Clermont, Florida.